Months ago, I shared my #1 trick for keeping our home organized (you can find out what it is here!). I LOVED compiling that post, and you all loved it too. I’m back today to share another one of my tried-and-true home strategies; and this time, I’m sharing my not-so-secret way to save tons of money on home decor while still getting the exact, unique and custom look you want for you home. Are you ready for it? Here it is! Seriously. I tell friends this over and over and over again. If you want to be able to quickly and easily make things for your home, buy a basic machine and learn to sew. I’m not suggesting that you need to be a master quilter, make homemade clothes for all your kids, or even make your own drapes. But owning and knowing how to operate a sewing machine will open up a whole world of creative possibilities for your home! Many people ask me how I’m able to get such unique looks in our homes and change out the decor so quickly and easily…and honestly, the answer is because I can make things myself. Instead of relying on pillows, curtains, bedspreads, and more available on store shelves, I can find just the right fabric (at just the right prices) and make them myself for a fraction of the cost. Yes, making items yourself does require a bit more time and effort, but once you get the hang of sewing, I promise you will be amazed at how quickly projects come together. I’m not the world’s best or most experienced sewer. In fact, I’m far from it. I’m self-taught, I hate following patterns, and I almost ALWAYS make things up as I go along (you can read more about my sewing story here). But I do know how to thread and use my machine, I can sew straight (and curved!) lines, I understand the basic principles of how items are put together, and have even mastered a few useful things like installing zippers and adding welting/pipping. There’s a ton I don’t know (but I am constantly learning and figuring things out, thank goodness for You Tube and blogs! 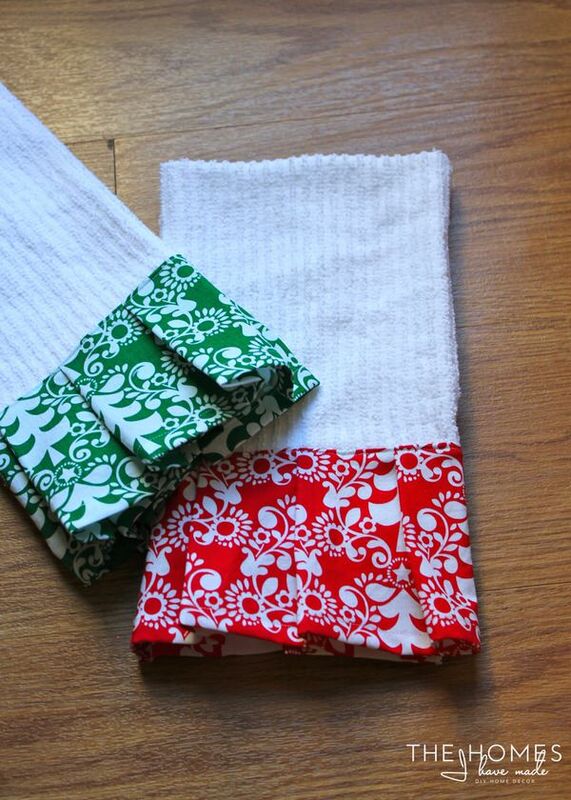 ), but I still never hesitate to sew my own home decor items when I can. While I could show you a ton of different sewing projects and inspirations, today I want to make the case for sewing by showing you a bunch of easy and wonderful things you can easily make for your home! Let’s get to it. 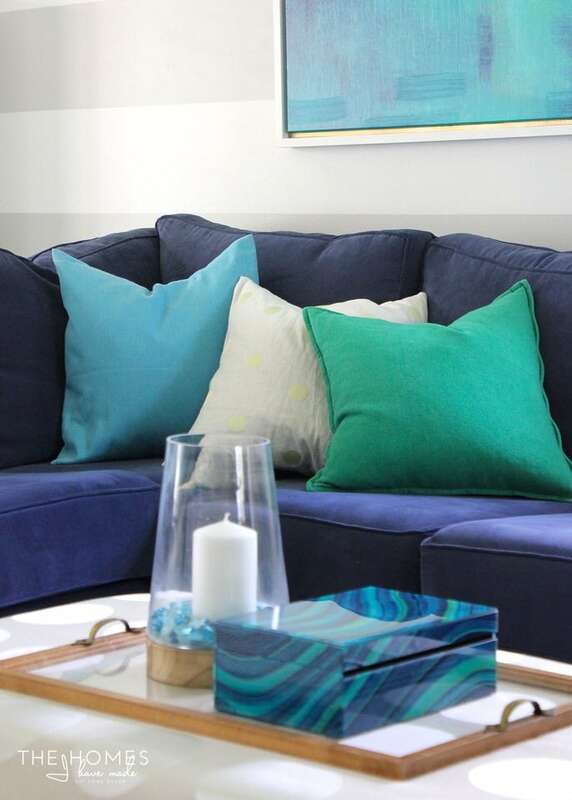 Pillows are some of the easiest and most gratifying projects you can make for your home. Not only do they require very little fabric, but they can be made in a variety of ways and in endless shapes and sizes so you can truly find just the right look for your home. 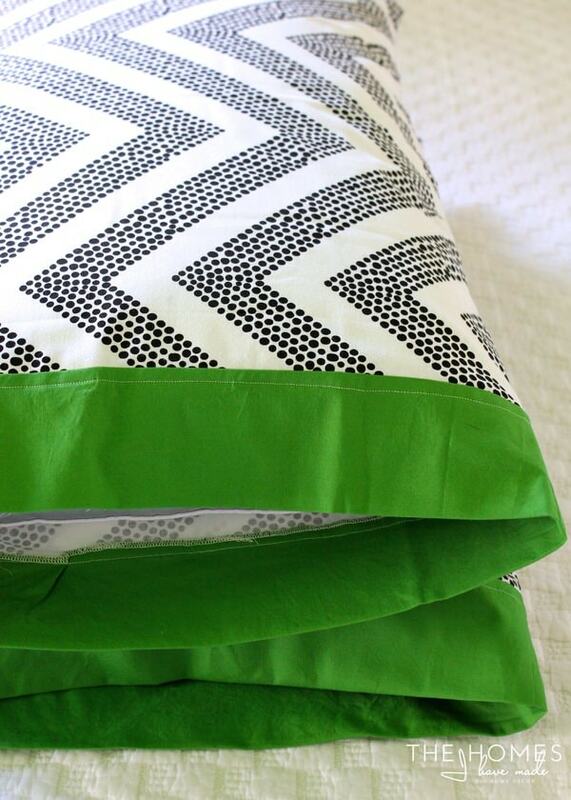 If you come across fabric you love, making pillow covers is the easiest way to bring it into your space! 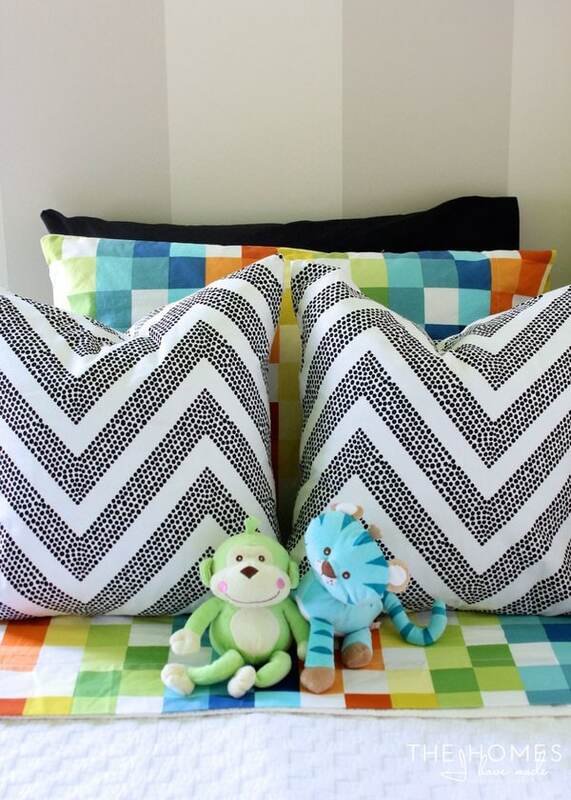 Our new bedroom features all handmade pillow covers! 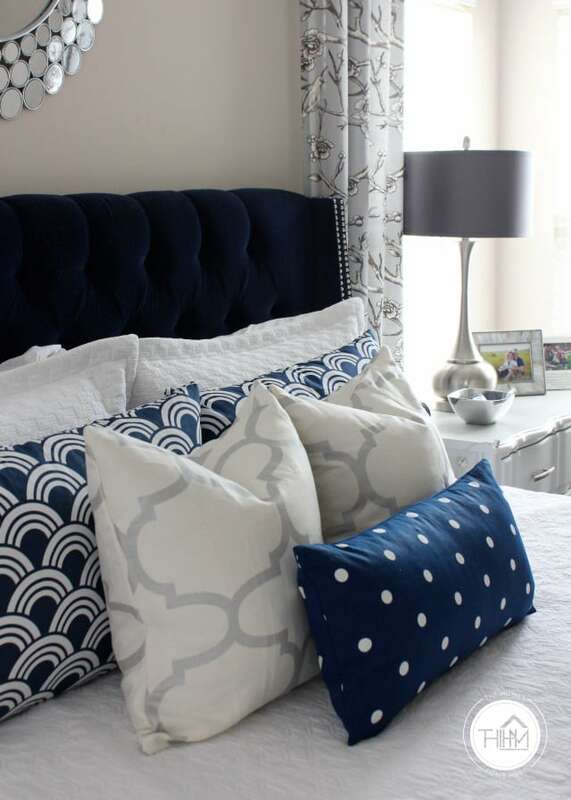 Quilted shams made from an old bedspread, blue shams out of inexpensive home decor fabric, throws made from an end-of-bolt scrap of high-end designer fabric, and a lumbar pillow made from polka dots repurposed from this space. All told, these 7 pillow covers cost me about $30, maybe even less?! 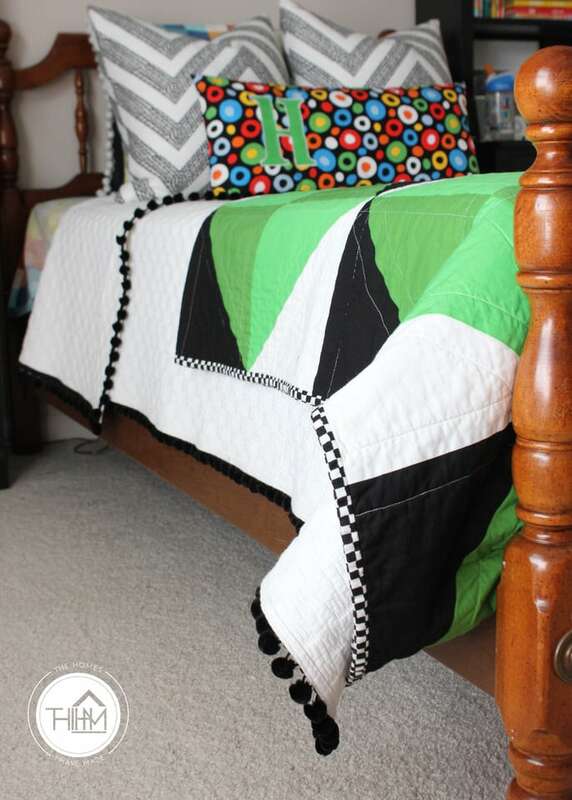 I LOVE mixing and matching store-bought items with found fabrics to create a completely unique display on beds. From pillow shams, to throw pillows, to pillowcases, all can be made from simple cotton fabric in an array of colors and patterns! You don’t need to make every pillow on your couch. 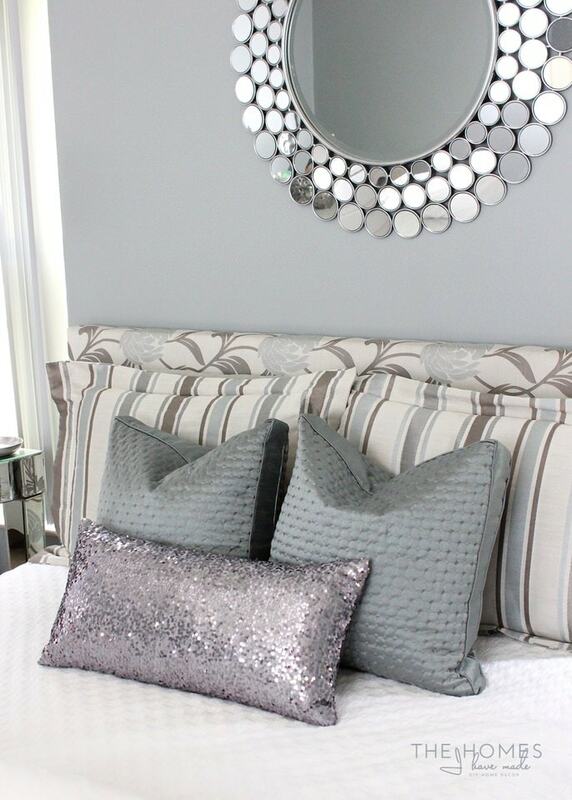 Combine store-bought pillows with DIY pillows in your favorite fabric finds for a truly high-low look! Don’t box yourself into just couch and floor pillows! 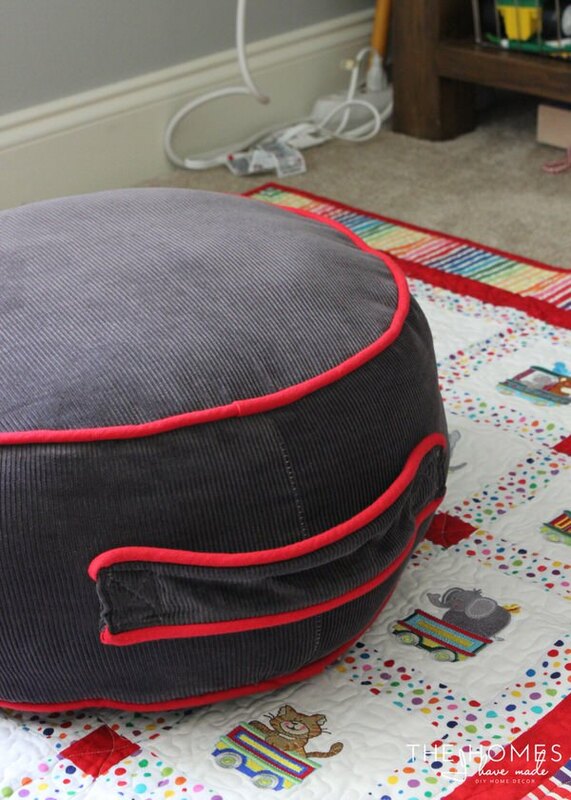 Floor cushions and poufs for adults and kids alike are fun, easy to sew and make for extra comfy seating for your next game or movie night! 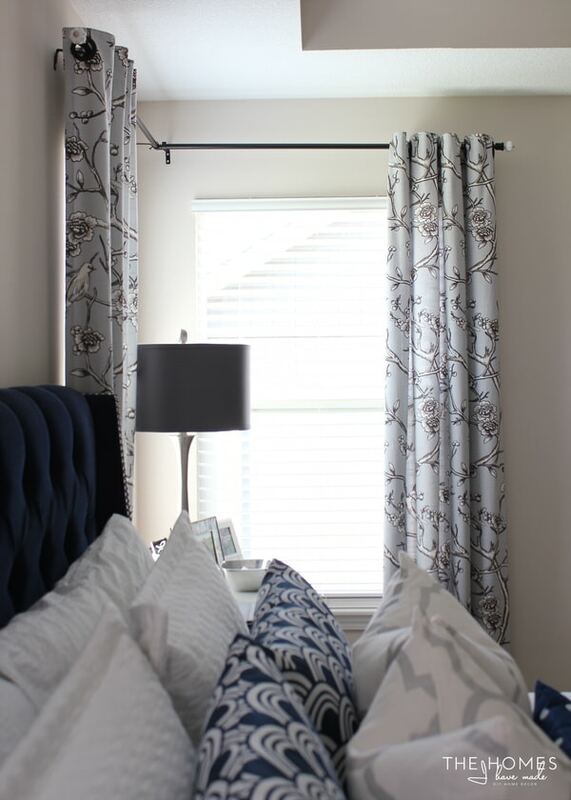 Honestly, making my own curtains is one of my favorite ways to save money AND get unique and custom looks for my home. I already made the case for curtains here, but today I want to re-affirm that 1) they make SUCH a difference in finishing a space, and 2) they are NOT that hard to make. If you can measure, sew straight lines, and iron, you CAN make your own curtains (I use THIS tutorial). 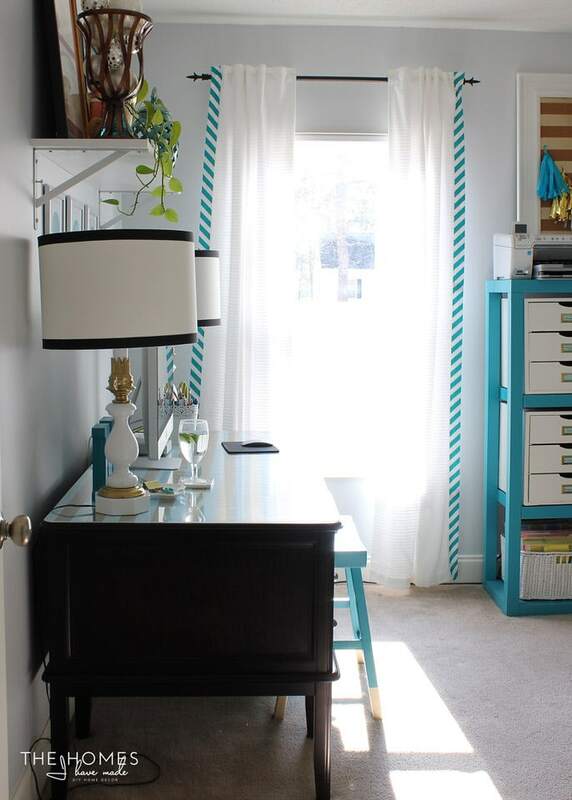 To keep your custom curtains affordable, it is best to look for fabric $10/yard or less. Most long curtains require about 3 yards of fabric, which translates to $30 (or less) for each panel. Not too bad when when they end up the exact size, color, pattern and design you want! I’m going up in complexity a bit, but even this next section of projects is completely do-able for the novice sewer. As most of you long-time readers know, I like to change up our existing furniture on a pretty regular basis, especially when we move into a new home. 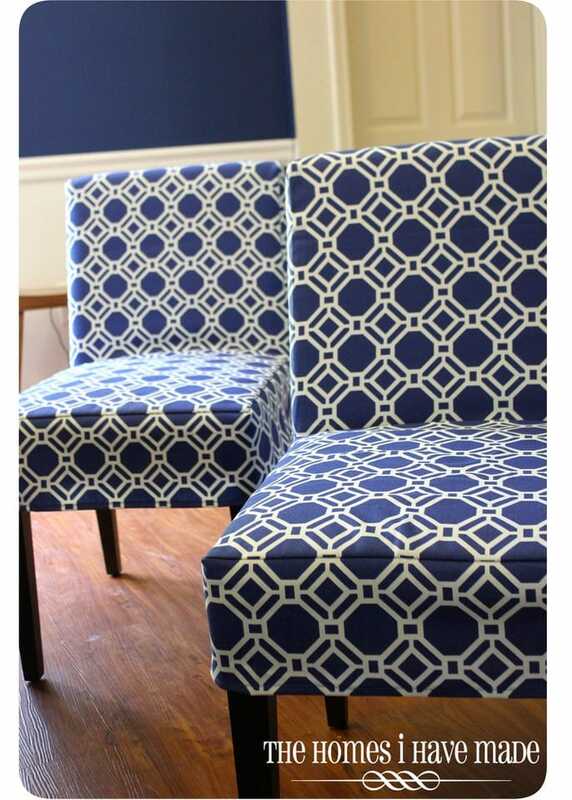 One of the biggest ways I update our “soft” furniture is to add custom-made slipcovers. 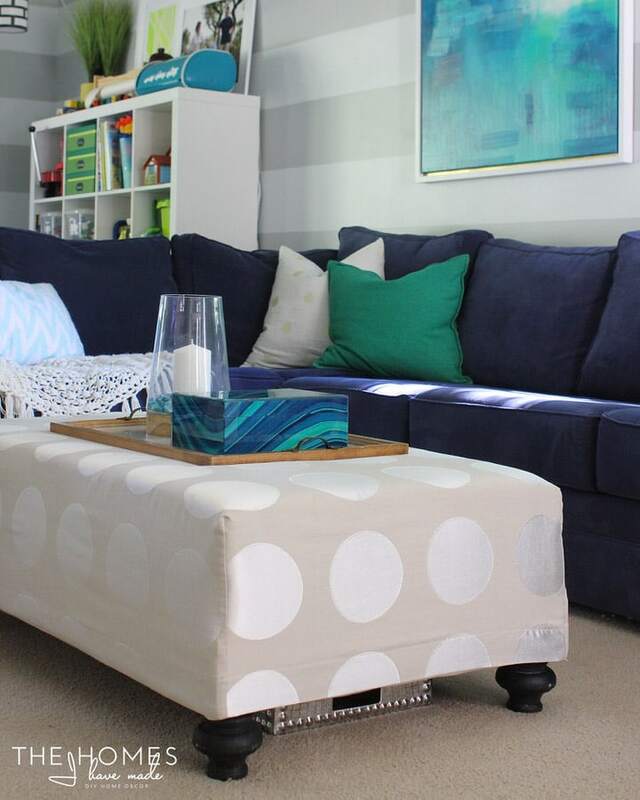 Slipcovers are a perfect solution for families with kids (hello, washing machine!) 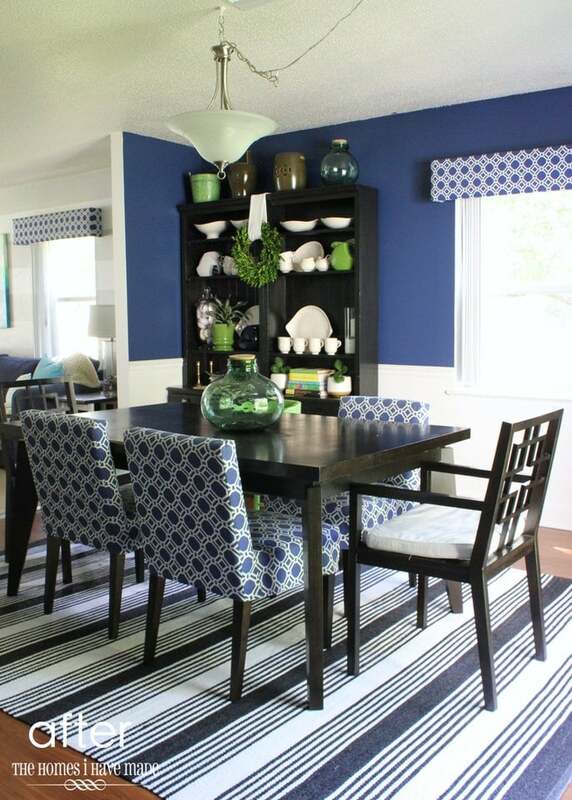 or for people like myself who crave fresh looks but don’t want to replace the furniture. I have slipcovered our basic parsons-style chairs in our last few homes. Once I figured out the initial pattern, these came together so quickly and were about $8 each! This slipcover for our ottoman (sewn from an IKEA curtain) was the perfect solution to keeping this white furniture piece nice and bright! It may look tricky, but it’s really four corner seams and a single hem around the bottom! Custom cushion covers are also a great way to tailor things for your home. 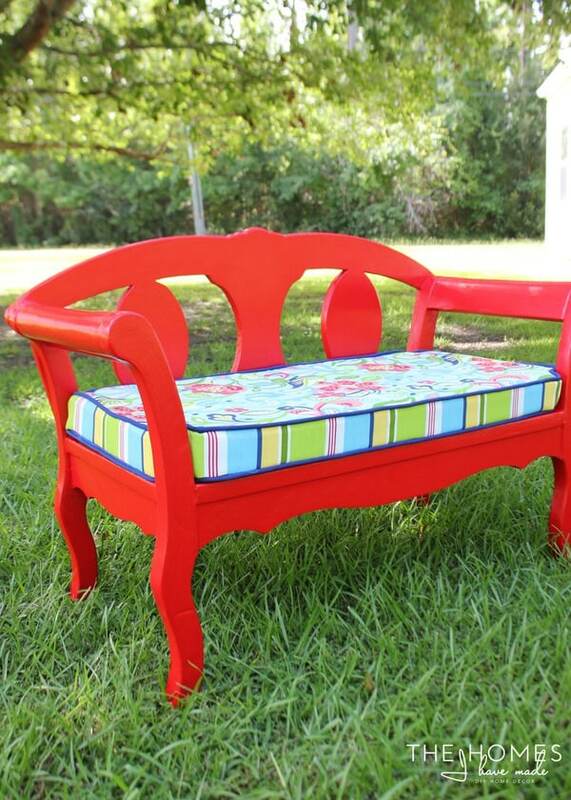 For this antique bench picked up an an auction, no store-bought cushion would fit just right. With some foam and coordinating fabrics, I was able to sew together a cushion that matched the shape and color of the bench just right! 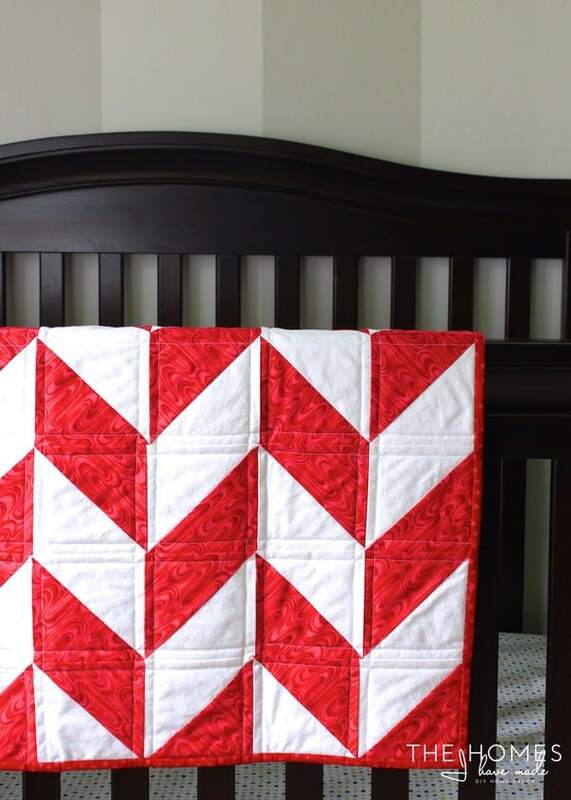 If you’re working on a room makeover, specifically a bedroom, living room, or nursery, and can’t find the one element to bring the whole room’s color palette together, a quilt just might do the trick! 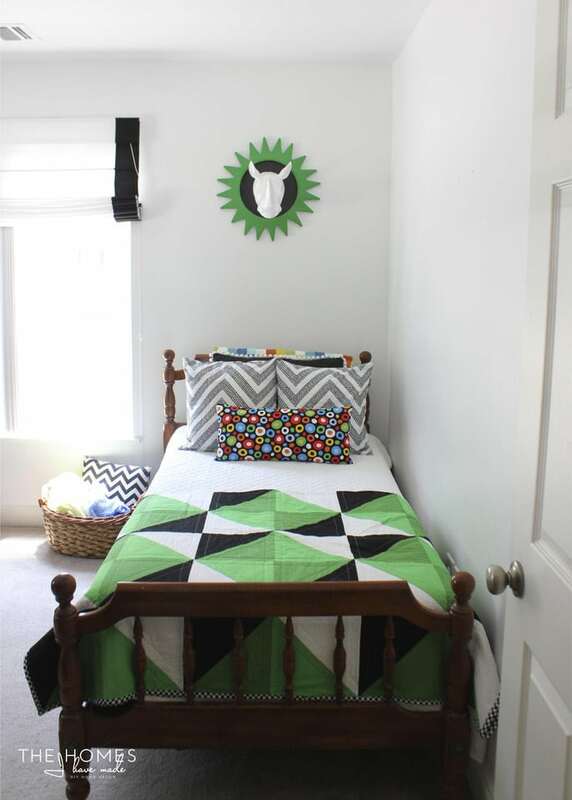 Since you can make quilts in any shapes, sizes, patterns and colors you wish, they can be the perfect way to unify (or inspire) the entire room’s decor. Don’t be intimated by quilts! If you can measure, cut and sew a straight line, you can handle these! 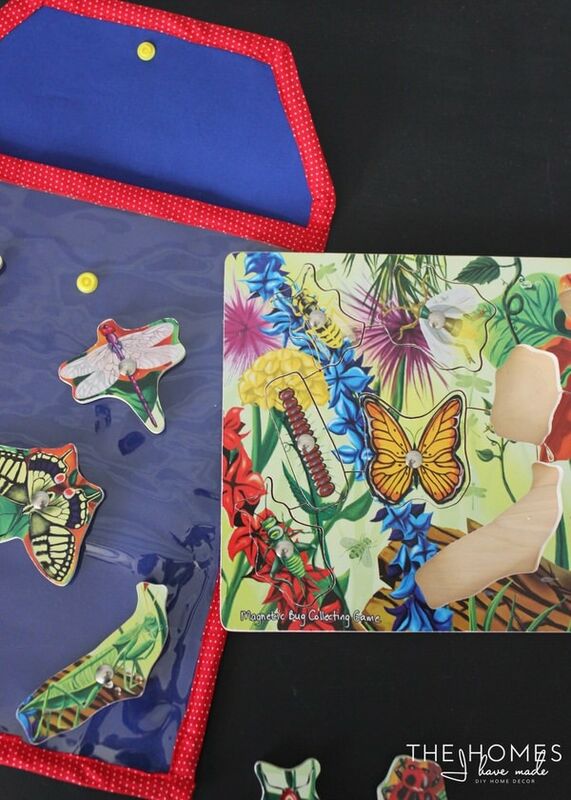 Sewing projects don’t always have to involve lots of fabric and lots of time. 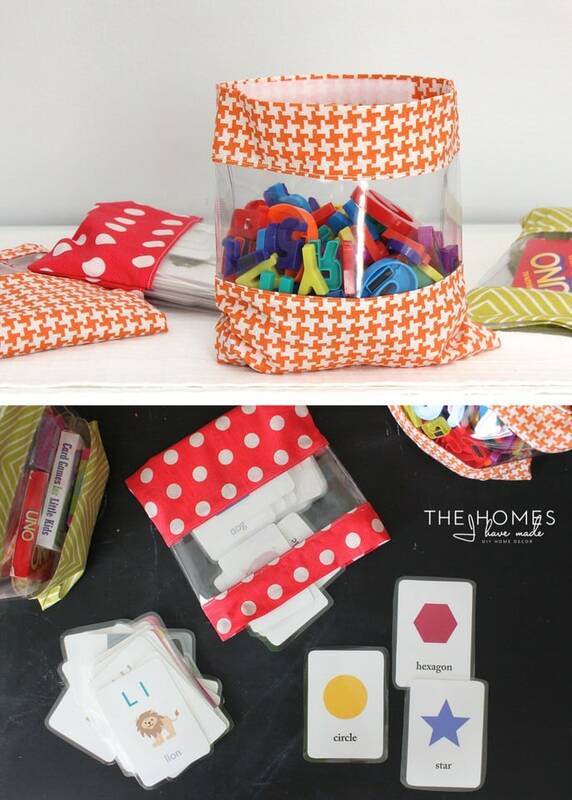 You can make small projects that can keep your home (or your life!) a little more tidy and organized. 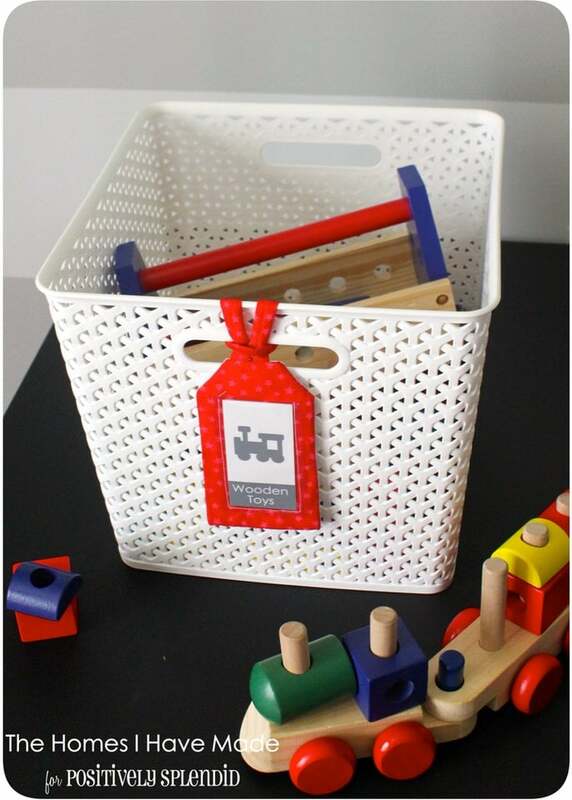 I LOVE sewing up storage solutions for our toys and other small household items. Not only do I get to play with my fun fabrics, but I can be certain they will fit just what I need them to since I make them custom to our needs! Last but not least, don’t feel like you have to frequent the fabric store and make all your projects from scratch out of carefully selected fabrics. 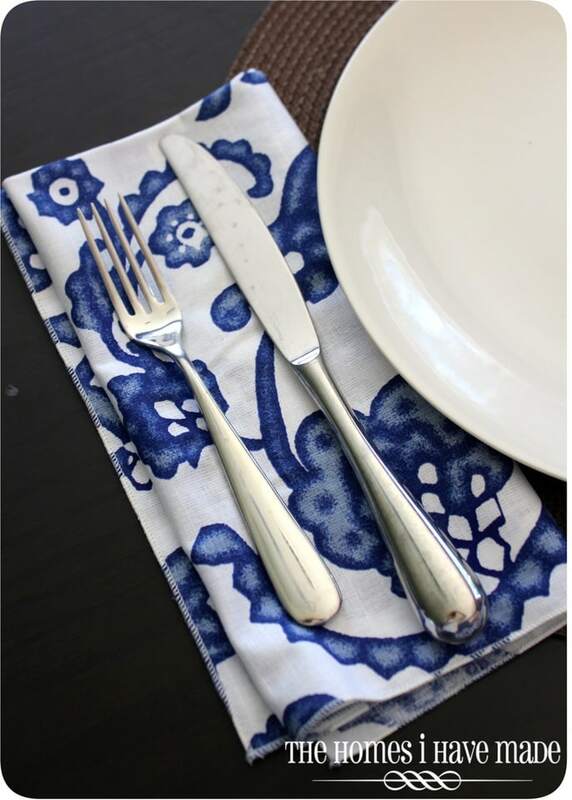 One of the best things about being able to sew is to customize and tailor off-the-shelf items to fit your home perfectly! From hemming your own curtains and adding zippers for easier pillow insert swapping, to adding decorative details or embellishing items with holiday fabric, if you can sew, you can make anything into a one-of-a-kind item! Admittedly, I am always a bit surprised when I meet people who don’t know how to sew. It’s certainly nothing against all the non-sewers out there…I think because I grew up with a Mom who was always at her sewing machine, and it’s something almost every other woman in my family does (or at least knows how to do! ), I assumed people grew up learning to sew. If you’re not a sewer, but love home decor and love to change it out for the seasons or your personality, this is my ‘atta girl’ (or guy!) speech to tell you to go learn to sew. Ask a family member, take a class, watch You Tube videos…these days, the opportunities for learning really are endless. In fact, I just found out that two local stores offer sewing and quilting lessons, so I am going to take the opportunity of living so close to improve my skills and learn a few things I’ve been struggling with (I’m looking at you serger). Sewing useful and beautiful items from raw fabric is one of the most gratifying things I’ve ever learned to do. Just putting this post together has given me the hankering to start a new project and get back to my machine! And wouldn’t you know it – tomorrow is National Sewing Machine Day (look at me, being all timely with my post! ), so it’s a perfect day dive in, wouldn’t you say?! I wonder what I should work on next…probably that quilt I still haven’t finished! I’d love to know…do you sew? Have you ever wanted to sew? What are you favorite things to sew? What skills do you need to improve? I hope you all had a fantastic Labor Day weekend. Ours’ was filled with lots of good times with visiting family, and I think we were all left way too exhausted to take on the short week. Things might be a bit bumpy around here this week as I play some serious catch up, but I do hope you all had a wonderful end to your summer and are ready to find or hit your September/Fall/New School Year groove! Hope to see you back here Friday! Great post! Like you, I am basically self taught…a few lessons from my mom when I was a child, but otherwise, just trial and error. 1. Thank you for the link to the post on adding a zipper to store bought pillows. I’ve seen some other bloggers mention it, but never a tutorial, and I always felt a little iffy about ripping open my pillows when I didn’t know what I was doing. I think I’ll probably give it a go now! 2. 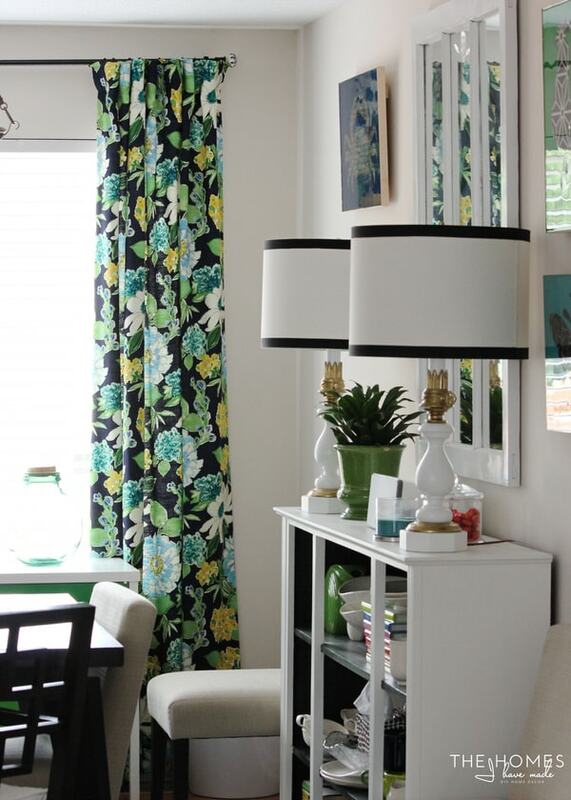 What fabric did you use for your floral dining room curtains? I’m sure it was mentioned somewhere, but I’m too lazy to look! The pattern is PERFECT for my dining room, probably as a table cloth and/or chair covers, though. Oh, and I guess one more thing…would you consider doing a whole house tour? I know you feel like things aren’t “done”, but I really would like to see your new house, as it is in progress. It will give a greater appreciation once reveal time comes 🙂 I still have trouble envisioning the space as we’ve only seen snippets here and there of projects since the move in tour. No stress, no need to clean up–PLEASE keep it real! But a little photo tour to show where you are in the process basically mirroring your move in tour would be really cool. I’m enjoying your site–started reading from beginning a couple of months ago and am up to Christmas 2014 🙂 Thanks for the great blog–keep up the good work! I have ONLY been able to find it cheaper at Hancock Fabrics, but I’ve seen it in almost every single one i’ve been in. Check the red bolt section, that’s usually where it is. I paid $14.99/yard for it, which is higher than I like but the colors were exactly what I needed so I went for it. I JUST returned 10 yards of it, lol, wish I’d thought to offer it to a reader first! Your dedication and support of my blog means the world – thanks so much for writing today! Happy Wednesday! LOVE to sew. My mom taught me when I was 5. And I still do it today. I do a lot of shirt sewing for my kids. But I have been working on some roman shades for my kids rooms. One set is even made out of a shower curtain. I picked up the other fabric at a yard sale for $2. So another place to look might be yard sales. I love your tips, you are spot on. Little things can make the entire room. 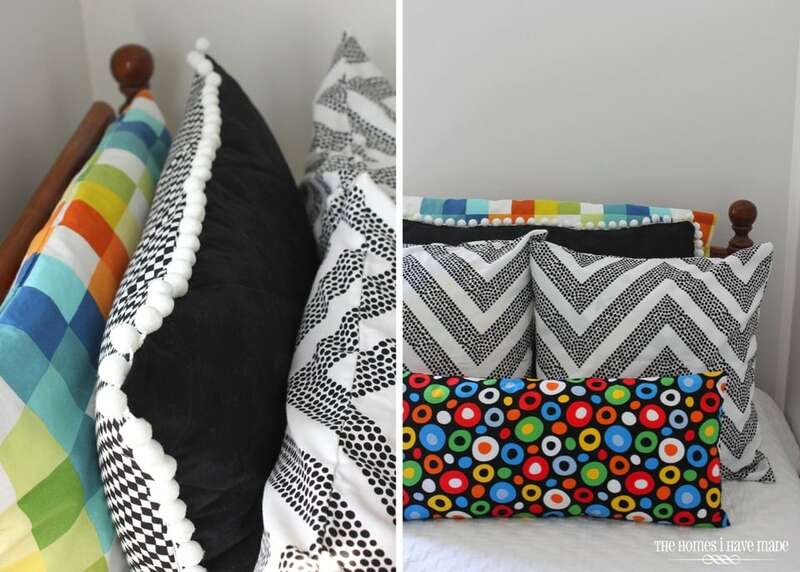 And sewing pillows are so easy and make a big impact. Thanks for commenting today!! Wow – you are brave to take on roman shades. Every time I attempt to make them myself, I chicken out 🙁 You’ll have to let me know how they turn out and how you made them! I have more experience with sewing by hand and plan on teaching myself to see by machine now that we have a house. My mom taught me both methods but focused on the hand techniques. Always been a bit intimidated by machines for some reason, but I have plenty of projects planned. Also a tip for your readers: if you have a hard time cutting straight like me and have a large project like curtains, take the material to a tailor. Most places don’t charge much for just cutting. Also great if you live in a small space and don’t have the room to cut. Love this tip, Haley! I never thought to use a tailor to cut…and I hate that part, lol! I’ll have to try that next time! I love your sewing projects. 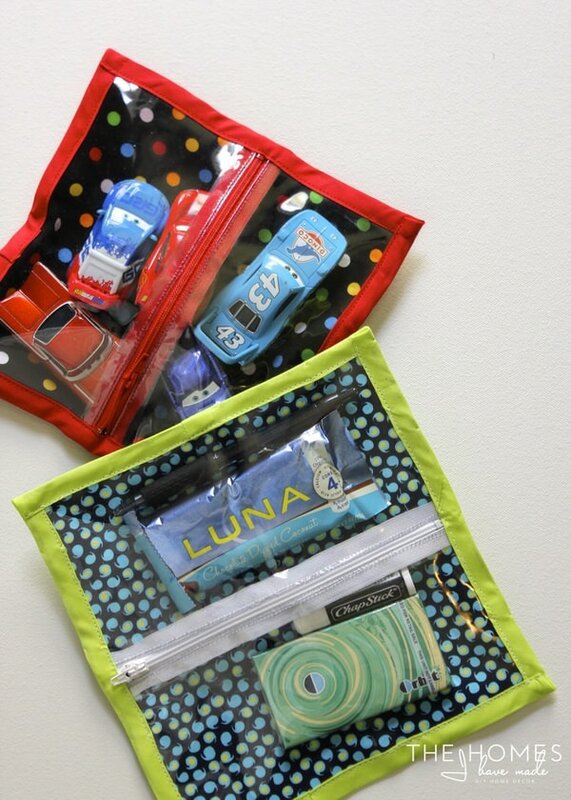 I am getting ready to make this little toy bags and wanted to know what gauge vinyl you used? I have a heavy one and I wonder if it won’t be flexible enough. Thanks! Hmmm…I’m not sure I can be much help! I’ve had my vinyl for ages and have no idea what gauge it is, lol. It’s pretty stiff though, so I’d say give your vinyl a try and see how it works out? Your comments last week literally had me laughing out loud! Thank you SO much leaving them!!! And to answer your question, Yes! Marines and AF can be stationed together…we were with a bunch of Air Force in Okinawa years ago, and here at this joint school we’re at now, some of our closest friends are AF! We’ll both be moving next summer, who knows where we could end up 🙂 And if we do end up close, I will happily teach you to sew!! PS And for those of us who didn’t grow up with mom’s who sew, it would be like coming to you and saying,”Ok. Now you are going to learn to flush a fuel line today from a You Tube video.” if your dad never opened the hood of his car at home, lol. You’ve always inspired me to learn how to sew! Maybe this post is my lightbulb moment to start a new hobby. Hey friend! Just going through all my blog comments today and responding! I do think you would really enjoy sewing…I got into more when I stopped working and needed SOMETHING to feel accomplished at the end of the day! I’d happily coach/cheer you along from Kansas, lol! Thanks for reading and for your support on my blog. Seeing comments from good friends help me feel connected and loved despite the distance! I’m pretty new to your blog and am loving it, especially this post! I learned to sew in high school and absolutely love the freedom it gives me to make exactly what I’m envisioning when I can’t find it in a store. And being able to see comes in so handy for gift-giving too! My sewing projects these days are usually quick and simple because my toddler and baby keep me pretty busy, but even small snatches of time are sufficient for a lot of the projects you highlighted. Thanks for your comment, Megan! So glad you found my blog and are enjoying it. 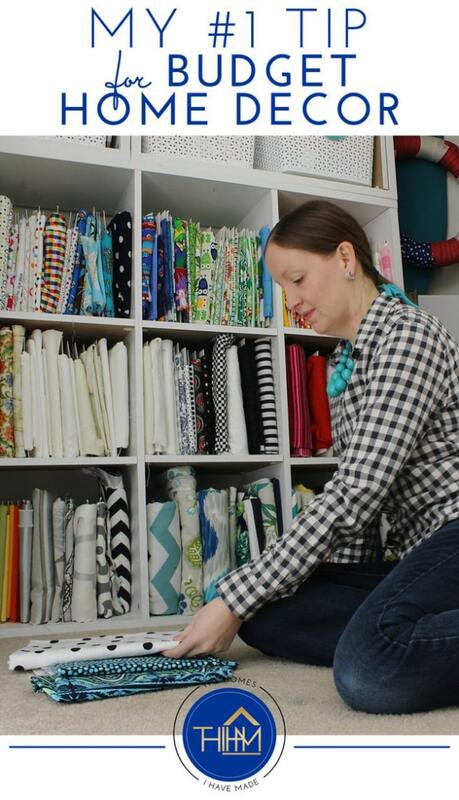 Sounds like you and I are into the same kind of sewing: quick, easy and gratifying! Hope you have a good rest of the weekend! Thank you so much for this comment, it literally had me laughing out loud! I took a fashion class in high school today – I spent all semester meticulously making a gorgeous dress with lining and darts and everything. It was fantastic…and then it didn’t fit. I think I swore off sewing clothes right then and there. To this day, I rarely sew clothes! I find home decor projects easier to tackle, so maybe start there?!? Glad you enjoyed this weeks’ posts! Have a great rest of the weekend! Haha o yes I know that all to well, and mine was lopsided (I tried to make a one shoulder top, obviously to advanced for me hehe!) I don’t blame you, I definitely did as well!! Thank you I hope you had a great weekend! Awesome post! I grew up around sewing women, but never touched a machine myself until after I had kids. Bought an $88 machine from Walmart and some $1 to practice on. Read the directions on how to thread the machine and that was it. I’ve made curtains, drapes, pillows, zippered pillow covers, blankets, hotpads, baby blankets, cute pillowcases… You name it, all from just sewing a straight line and no skill! Truly, it’s not hard and it’s super empowering to be able to make exactly what you want! Thanks so much for this comment, Janet! Sounds like we have a similar introduction to sewing & skill set! Love hearing that I’m not the only one self-taught! I totally agree! Knowing how to sew opens up a world of possibilities. My mom knew how to sew very well (and did it for a living for awhile). She taught me a little bit, but I didn’t really start sewing a lot until after she passed away. I’ve hemmed my own pants (#shortgirlproblems), made my own drapes, pillows/pillow covers, window seat cushion covers, tote bags, Halloween costumes, etc. In fact, I’ve already made 4 Halloween costumes for this year at a fraction of what it would cost to buy 1 store bought costume! It’s definitely a helpful thing to know how to do! Here, here, Chrissy! I couldn’t agree more! Sounds like you and I are birds of a feather – short girl problems here too, and I love making the same kinds of projects. Although, if you have Halloween costumes done, I applaud you – costumes/clothes are not my thing! Thanks so much for chiming in! Have a good night!